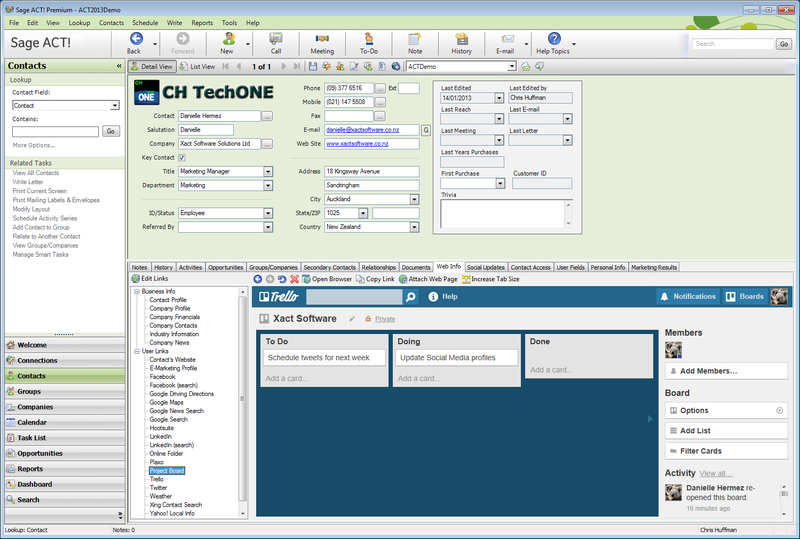 CRM Informer: Project Management & Customer Service in ACT! In this post we will cover how you can use the Web Info tab to manage projects and offer great customer service. If you’re business deals in projects you will have situations where you've needed to track progress and communicate with everyone involved including staff, customers and other service providers. Trello is a free online collaboration tool that organizes your projects into boards; boards contain multiple lists each referring to a specific stage in the workflow purpose, and each list has cards which detail specific tasks/features or other relevant information. When a board is created you can add members and share it and as the project progresses you can see cards being moved across the lists and view a complete history of all members’ activity on the board. By implementing it to ACT! you can instantly see the progress of the project that the current ACT! contact is involved with and can interact with the project board from within ACT!. Choose the ACT! 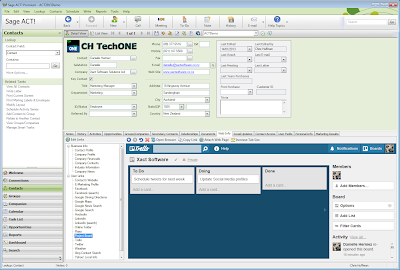 Contact(s) and corresponding Trello board. Copy the URL snippet of the board and paste it to the “Project Management” field of all the related contacts. That's right, if your business has FAQ's and help files on your website implementing this to the Web Info tab can help you find the information you need to serve your customers, fast. We implemented our website in two ways to ACT! The first was simply creating a new Web Info URL and entering our website – no custom fields or merge tags required. The second way was to define which specific web page we wanted to see when viewing each contact. Now if your customers ring up with questions about your products/services you can easily be directed to helpful resources from your website that are relevant to your customer. Note: this strategy can be applied to your website or any other website that you turn to for information. Stay tuned for our next blog where we show you how you can access documents and files from the cloud and view e-marketing contact stats (for people who aren't using Swiftpage) all from within ACT! In the meantime if you have implemented any of the tools above or any other free online tool to the Web Info tab let us know – we’d love to hear how having these tools available in ACT! have helped your business.